TownePlace Suites Harrisburg Hershey is excited to announce their stylish transformation. HARRISBURG, PA--(Marketwired - Mar 8, 2016) - To achieve value, you don't have to sacrifice design. That is what the recent renovations at TownePlace Suites Harrisburg Hershey suggest. Boasting a fresh and modern look from top to bottom, this budget-friendly destination combines form and function so well that it has reset the bar for hotels throughout Harrisburg. "The changes we implemented have updated the hotel in important ways," said General Manager Marcia Eckhart. "Now guests can enjoy all the practical conveniences that TownePlace Suites Harrisburg Hershey has been known for since opening in 2008, and they can do so within interiors that feel truly inspiring." The changes greet visitors immediately. Both the lobby and the breakfast room now feature new furniture, carpet, paint and décor. Not only are the resulting spaces brighter and more attractive, they also engage guests in more meaningful ways. The flexible seating in the lobby, for example, invites conversation among friends and colleagues as well as individual downtime. The breakfast room features both tables and booths for greater convenience. Further distinguishing the property among hotels in Hershey, Pennsylvania are the 107 updated guest rooms. At once streamlined and inviting, these spaces boast new furniture, carpet, bedding, décor and even lighting. The light wood, sunny yellow walls and accent walls in rich earth tones create a vibrant repartee within each room and around such practical features as built-in desks and pullout sofa beds. Since kitchens are often the workhorse of any residence, the hotel installed new floors in every suite's kitchen. Updated corridors outfitted with new carpet, paint and décor create a seamless transition between renovated spaces. And, in a final flourish of luxury, all the guest room closets now feature Closet Envy Elfa systems, perfect for those enjoying an extended stay -- or those looking for organizational inspiration for home. No matter what brings guests to town, from business to leisure, TownePlace Suites' new look and continued attentive service make it a top choice among hotels near Hersheypark. 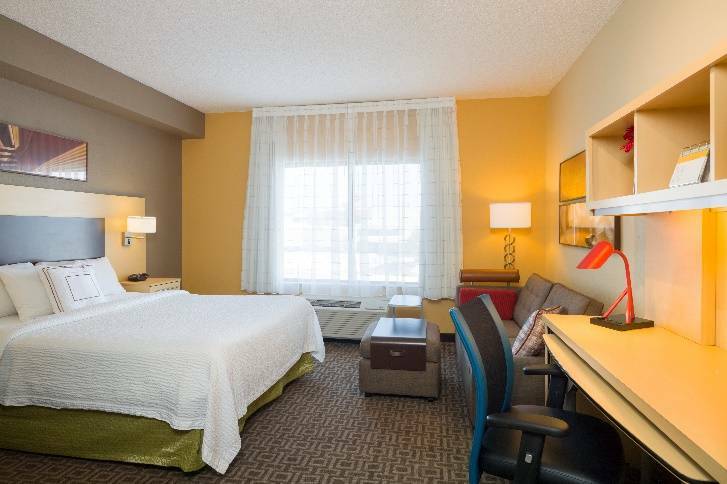 Offering visitors spacious and newly renovated accommodations, a wealth of convenient amenities and numerous nearby attractions, TownePlace Suites Harrisburg Hershey is an ideal destination for both short and long-term stays. Individuals and groups alike will appreciate the studio and one- and two-bedroom suites, which are 25-percent larger than average and feature full kitchens, free Wi-Fi and ergonomic workspaces. And with free breakfast, on-site parking, a pet-friendly policy and a 24-hour fitness center with a heated indoor pool, TownePlace Suites Harrisburg Hershey makes it easy to make yourself at home. Located among hotels near Hersheypark, Pennsylvania, the property is enviably situated with attractions like Gettysburg, Amish country, downtown Harrisburg and more all close by.